Orchard Manor Unit 1 has an open plan kitchenette, dining room, lounge and main bedroom with king bed. A side room and loft contain 2 singles and a 3/4 bed. The unit shares one large bathroom with a stunning mountain view, containing a bath and shower. There is a cosy fireplace and a beautiful outdoor braai area, looking on to Cathkin and Champagne Castle mountain peaks. For those with mobility limitations, it has an access ramp, raised bed, lip-free shower with grab rail, and raised toilet. 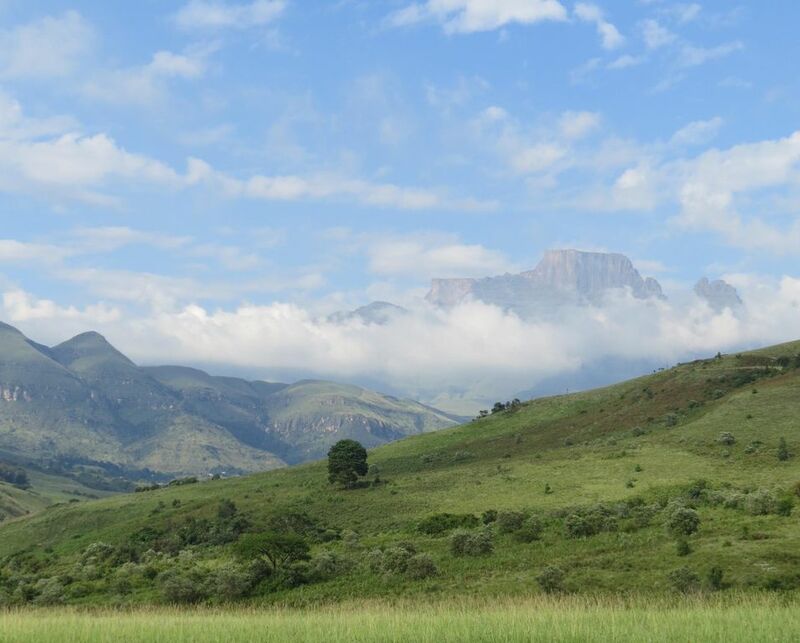 We are situated in Champagne Valley of the beautiful Central Drakensberg of South Africa, on the property of Dragon Peaks Mountain Resort, which borders the UNESCO Maloti-Drakensberg Park (uKhahlamba), listed as both a cultural and natural world heritage site. Orchard Manor is set amongst two fruit tree groves on a hill side above Mount Champagne and the Drakensberg Boys Choir School. Situated five minutes drive (1.3km) by private road from the reception, Orchard Manor offers the perfect retreat for those seeking privacy in the mountains. Orchard Manor contains two fully equipped, self-catering units that sleep 5 and 6 people respectively, with each unit situated on opposite ends of the Manor. Walking out onto the spacious back lawn, guests find themselves met with commanding views of Cathkin and Champagne Castle mountain peaks. This is a one of a kind opportunity to stay in a country manor house overlooking beautiful mountains. Great communication with the host. Clean and lovely and lots to do in the region. Book it! Everything was clean and well kept. The beds were comfortable and the home was well supplied for our needs. The location was perfect - quiet and peaceful but close to lots of hiking and other things to see and do. I would absolutely recommend it.